Not the best lighting in this picture but focus on Caleb's shirt. Next to Caleb you can see the white tracing of Caleb in paper taped to the closet wall. This paper Caleb has served as our puzzle to place the organs in the correct locations. He is standing next to it in his newly drawn shirt. 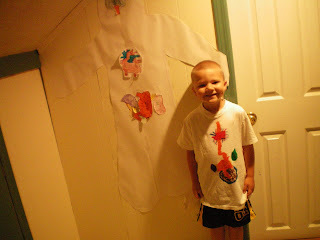 For a project he asked to use a white undershirt to draw his digestive system. I did not help him 1 bit on this project. He got the shirt, the markers and began to drawn his digestive system on this white shirt. I was helping Nathan with his Hooked on Phonics and when I came back in the room this shirt is what he had done. I about fell over. It is difficult to see, but the pancreas is drawn in yellow in the correct spot and he drew it just as the book has it done (looks like a corn on the cob) . The spleen and gallbladder are correctly placed as well as all the other organs. He will proudly tell you what each one does and what types of food it will help you digest. He will also tell you:"Mom, doesn't have a gallbladder anymore so she shouldn't eat too much fat or McDonald's." Caleb's shirt also has the heart drawn to illustrate both red and blue blood flow. 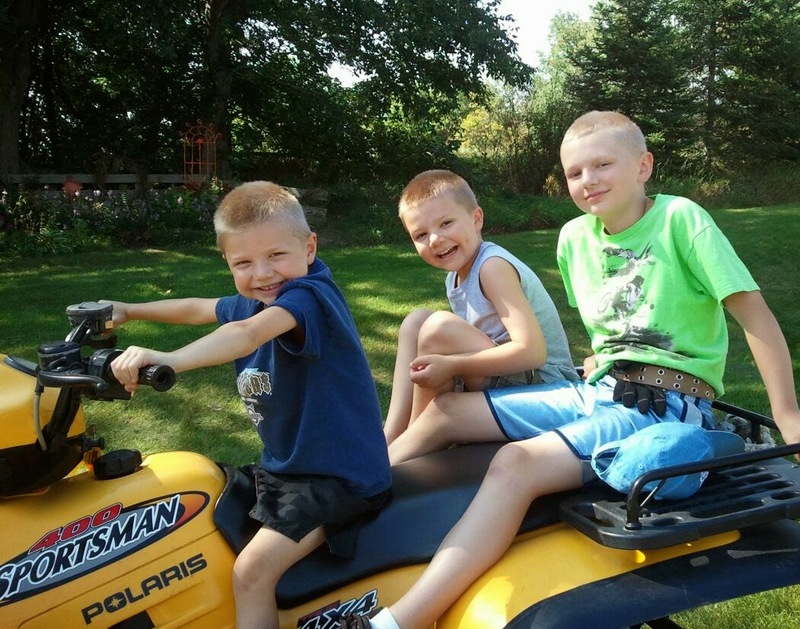 We studied the heart first because of Nathan's heart valve dysfunction. The only regret I have is that he drew it in washable markers. It is a work of art! Amazing to get a picture of just what he retained from our science classes so far this year.